From the bestselling author of the beloved The Storied Life of A. J. Fikry comes another perfect fable for our times–a story about women, choices, and recovering from past mistakes. Gabrielle Zevin is an amazing writer, and in Young Jane Young, she captures the voices of the women narrators so well that it’s like hearing these very different people speak directly to us. In turns narrated by Rachel (Aviva’s mother), Jane, her daughter Ruby, Embeth (the Congressman’s wife), and Aviva, we get a series of viewpoints and reactions to Aviva’s youthful mistake and how its consequences have persisted and affected all of their lives over the years. Jane is grown-up Aviva, and she looks back on her 20s as if they were lived by a different person. She’s reinvented herself and left her past behind, but of course, nothing ever truly goes away. And to make a fresh start, she’s also left behind her mother, once her best friend, whom she equates with her shame and the insecurities of her past. Meanwhile, Ruby has no idea who her mother once was, and when the truth inevitably comes out, has to deal with the fallout in her own unique style. The discovery of your shame is one click away. Everyone’s is, not that that makes it any better. In high school, you read The Scarlet Letter, and it occurs to you that this is what the Internet is like. There’s that scene at the beginning where Hester Prynne is forced to stand in the town square for the afternoon. Maybe three or four hours. Whatever the time, it’s unbearable to her. You will be standing in that square forever. You will wear that “A” until you’re dead. The way these books work is you get to the end of a section, and you make a choice, and then you turn to the corresponding page for that choice. You think how much these books are like life. Except in Choose Your Own Adventure, you can move backward, and you can choose something else if you don’t like how the story turned out, or if you just want to know the other possible outcomes. You would like to do that, but you can’t. Life moves relentlessly forward. You turn to the next page, or you stop reading. If you stop reading, the story is over. Ultimately, as Aviva narrates her choices and their outcomes, we see how she comes to the point where her only real option is reinvention — starting over as a new person, in a new place, and leaving her former story behind altogether. Young Jane Young is witty, sad, entertaining, and unfortunately very real in what it has to say about women’s lives and women’s choices. Aviva made mistakes, to be certain — but she didn’t make them alone, and long past the point where she should be done paying, she still is stuck with the labels and judgments that she bears. Public opinion, sad to stay, still excuses the wealthy, well-positioned male in ways that it won’t for the young, foolish female. The disparity in the outcomes for Aviva and the Congressman are startling and upsetting, yet match quite well with what we all see in real-life public scandals and the apportionment of public shame. I suppose, too, that Young Jane Young could serve as a sort of cautionary tale for people (especially women) on the cusp of their adult lives who don’t yet realize the permanence of certain choices and mistakes. But the book is much more than that. It shines a light on women’s relationships — the bonds of friendship, family, and compassion — and shows how vital these connections are in order to lead healthy lives. It shows the damage done, even without meaning to, by the constant judging that women endure over things — body size, clothing choices, etc — that really shouldn’t matter. It’s a bold feminist statement about the ongoing inequality in the public view, and how women are still held to different standards and face different consequences than their male counterparts. I highly recommend Young Jane Young. Gabrielle Zevin creates people we care about, and she has a talent for making these character feel like people we might meet in our daily lives. I definitely laughed quite a bit while reading it (Rachel and Ruby in particular are terrifically funny people, even when experiencing moments that aren’t funny at all) — but also found myself sad and indignant and ready for a fight! 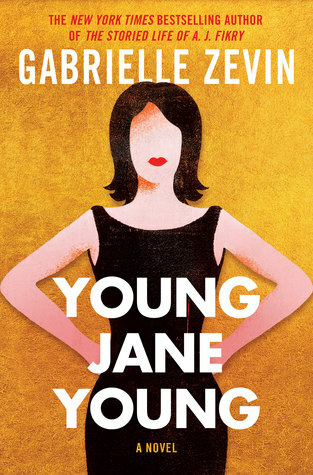 If you enjoy strong, entertaining, intelligent, vulnerable women leading the way, definitely check out Young Jane Young. I hope you enjoy it! I’d love to hear what you think! This sounds good. Am I right in thinking it’s derived a little from Monica Lewinsky? Oh, definitely inspired by. In fact, at some point in the novel they refer to Aviva as the Monica Lewinsky of South Florida.